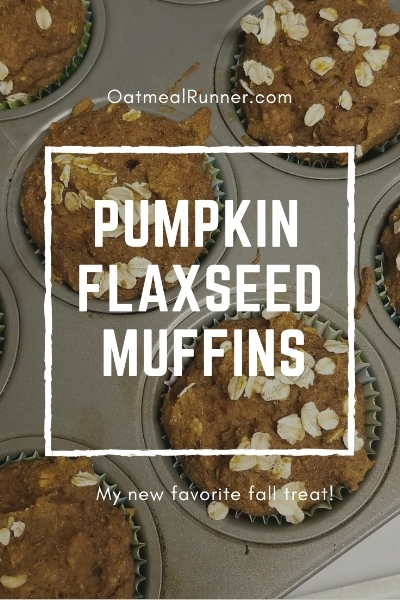 Pumpkin Flaxseed Muffin: My New Favorite Fall Treat! Since I’m not training for a fall marathon, I’ve been loving baking and experimenting with new recipes. And, of course, I had to create a pumpkin muffin recipe with one of my new favorite things: flaxseeds. These muffins come together so quickly and are perfect to eat before a workout! In a large bowl, beat the applesauce and honey together with a whisk. Add the eggs, and beat well. Mix in the pumpkin purée and milk, followed by the baking soda, vanilla extract, salt, and spices. Add the flour, flaxseed and oats to the bowl and mix until combined. If you’d like to add any additional mix-ins, like nuts, chocolate or dried fruit, fold them in now. Place the muffin tin on a cooling rack to cool. These muffins are delicate until they cool down but mine came out easily from the pan once cooled. Now that we are in summer, I’ve found myself eating more and more smoothies and smoothie bowls. Which means I’m trying find ways to keep them tasting different so I don’t get sick of something that tastes so good when it is hot outside. Today I’m sharing my list of add-ins for smoothies and smoothie bowls to help you mix up your flavors! If you are looking for some smoothie or smoothie bowl recipes, I have my basic chocolate smoothie bowl recipe and three quick smoothies I have enjoyed. What are your favorite add-ins? Share them in the comments!